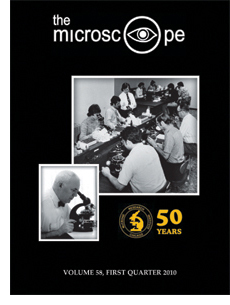 On the cover: McCrone Research Institute in Chicago observes its 50th anniversary in 2010, marking a distinguished history of microscopy education, microanalytical research, and book and journal publishing. The cover shows Institute founder Dr. Walter C. McCrone in 1976 and a microscopy class in the 1970s. See Editorial: 50 Years of Microscopy Education and Research by Gary J. Laughlin.